I remember taking my daughter to Never Never Land at Point Defiance Park in Tacoma when she was young. It was run down at that point, but we enjoyed it in its woodland setting. This evening our family took the Once In A Lifetime Underground Tacoma Flashlight Tour, which was offered by Angela Jossy http://www.theangelajossy.com/artbus.htm. The tour included several wonderful sites including the entrance to the underground tunnel, the soon to be filled under the sidewalk space and several historic buildings. But to me, the highlight was the chance to see the Never Never Land figures again. They are stored in the basement of a historic building near fireman’s park and I have a vague impression that the exact location is a secret. 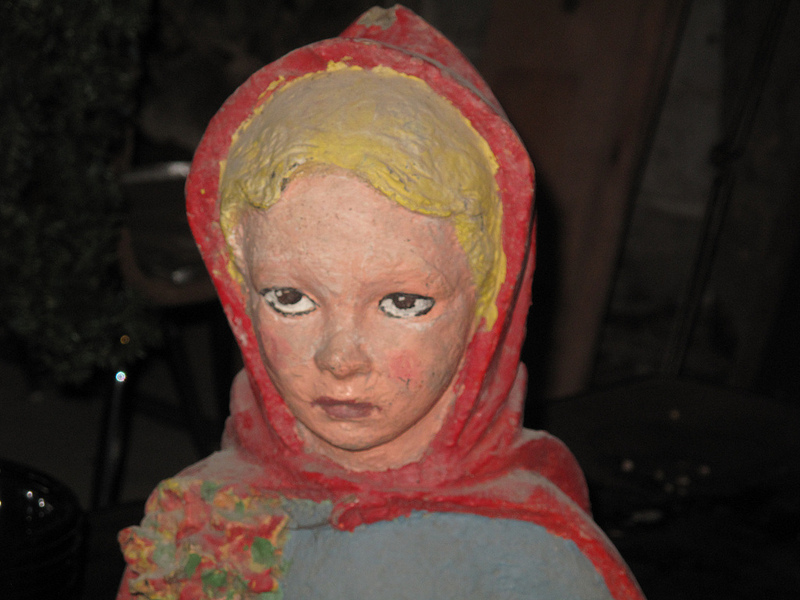 The smell of basement combined with the layer of dust provided an eerie vibe and dear daughter was more than ready to go outside, but I was happy to stretch out the time and examine each figure. The park was created in 1964 and by the late 2000s most of the figurines had been removed. The last of the structures in the park (the stack of books entrance and the shoe/slide) were demolished in the fall of 2010. This entry was posted in Art -- there is art here!, Historic Sites, Once in a while events, Tacoma, WA State - Pierce County and tagged fairy tale, fairy tales, figurines, Little, never never land, Red, Red Riding Hood, Ridinghood, sculpture, Tacoma, Three Little Pigs, tour basement, undergroud on November 24, 2012 by admin.